On August 30, 2013 Mr. Marius Opran, Director of the BSCSIF Brussels branch, has paid an official visit at the European External Action Service (EEAS) headquarters in Brussels in order to grant the Grand Prize for the year 2012 to the High Representative of the Union for Foreign Affairs & Security Policy/Vice-President of the European Commission, H.E. 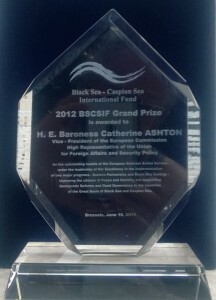 Baroness Catherine Ashton, by the International Fund for Cooperation and Partnership of the Black Sea and Caspian Sea. The BSCSIF’s Board of Directiors decision, taken unanimously on the 14th of April, 2013, in Instanbul, represents an acknowledgement of the major personal contribution brought by H.E. Baroness Catherine Ashton as a High Representative of the Union for Foreign Affairs, in the development of two grand programms of EU- Eastern Partnership and Black Sea Sinergy, of which several BSCSIF member countries are benefiting. On this occasion, Mr. Opran had an open discussion with Mr. Edward Bannerman, member of the Cabinet and the adviser on economic issues of the High Representative of the Union, taking into consideration the ways in which BSCSIF could cooperate with EEAS and the European Commission’s General Directorate, supporting the implementation of theabove mentioned programmes, the Commission’s programme Eastern Neighbourhood Partnership, as well as the development of new subjects on common fields of interest.